To attend the Racine County Fair nowadays, fair-goers head for Union Grove and Old Settlers Park. There was a time from 1864 through 1885, however, when Burlington would have been their destination. "All have had enough of the Union Grove accommodations – if that is the word – which are too well known to need enumeration. Fair-goers – exhibitors and spectators – have fully made up their mind that the location of the Fair must be changed – either to Burlington or Racine." The Standard, of course, favored Burlington, saying that no place in the County could furnish better accommodations for the people and their stock and articles of exhibition. Burlington businessman Pliny M. Perkins offered 10 acres of land, not more than a quarter mile from the business part of the town, between Chestnut street and the White River from about Conkey street nearly to James street. The area, with the oval race track, is shown in the lower right portion of the accompanying cut from an 1871 lithograph of Burlington drawn by H. H. Bailey and published by T. M. Fowler and Company of Madison, Wis. In January 1864, the Society met at Union Grove to elect officers and to decide on the location of the Fair. While Burlington citizens attended in large numbers, some towns sent no representatives at all, and Racine only one, lawyer John Tapley. Mr. Tapley was unanimously elected to the Society's presidency for the ensuing year. The Burlington delegates had it in their power at that time to locate the Fair in their own town, said the Standard, but "with a magnanimity seldom manifested in a body of that kind, and which we trust will be remembered," left the decision to an 11-member committee composed of two persons from Racine and one from each of the County's nine towns. Mr. Tapley and J. I. Case represented Racine while Burlington was represented by Francis Reuschlein, Rochester by George W. Hoyt, and Waterford by Archibald Cooper. At a February meeting in Burlington, the committee voted unanimously in favor of J. I. Case's motion that the Fair be held in Burlington for the next three years. At the meeting, the rules, regulations, and admission fees were set, the list of premiums was adopted, and the judges for the various competitions were named. The time of the 1864 Fair – the 14th annual fair and the first to be held in Burlington – was later set for October 11 through 13. In June the posts and boards of the old fair grounds at Union Grove were drawn to Burlington, and preparations made for enclosing the new grounds. Through the rest of the summer, Burlington's fair grounds were put in good shape and work was started to fashion a race track. In September a number of citizens turned out on a Friday afternoon with a span of horses and a scraper, together with shovels and hoes, and went to work on the race track that, when prepared as intended, was to be the best in the State. On Saturday afternoon, teams and vehicles of all descriptions turned out – trotting horses pulling sulkies and single buggies, and good steady teams pulling double carriages and lumber wagons – to beat down the track. For amusement, a purse of five dollars was raised among the spectators for the fastest horse in a "scrub" race and on a trot. "Copper Bottom," owned by L. Hill of East Troy, won both events. At the beginning of October, the Society advertised that the Racine & Mississippi Rail Road, which ran through Burlington and which later became part of the Chicago, Milwaukee, and St. Paul Railroad, had agreed to carry passengers and property for exhibition at half rates. The Society also announced that Charles E. Dyer of Racine, who had grown up in Burlington, would deliver the Annual Address. Following the Fair, the Standard reported it to be a decided success. The weather was fine, the entries numerous and varied, and the people in attendance numbered in the thousands. The receipts were reported to amount to between $1300 and $1400. Exhibitors awarded premiums included many with names familiar in the history of Burlington and the surrounding area – Aldrich, Cooper, Alaxson, Forbes, Smith, Wagner, Winkler, Kesler, Weygand, Wood, Mathews, Prailes, Foltz, Bailey, Cady, Perkins, Duckett, Trowbridge, Case, Bull, Muth, Humbert, Neuhaus, Thompson, Knight, Hockings, Richards, Fisk, Sawyer, Smiley, Storms, Phelps, Scott, Russell, Roby, Fairbanks, Palmer, Martin, Nims, Fink, Keuper, Meadows, Healy, Crane, Hand, Whitman, and Peck. In the following years, a Floral Hall – a large octagonal shaped building with wings to the east, south, and west – was added to the Fair Grounds as were a thousand-seat grandstand, stables, and other buildings. The Fair continued to be held in Burlington through September 1885, after which the Wisconsin Central Railroad took possession of the Burlington Fair Grounds, laid its tracks through Burlington, and in 1886 built its depot. In an attempt to continue the Fair in Burlington, Nicholas Weiler offered to rent suitable grounds near the village to the Agricultural Society, but the offer was not accepted. 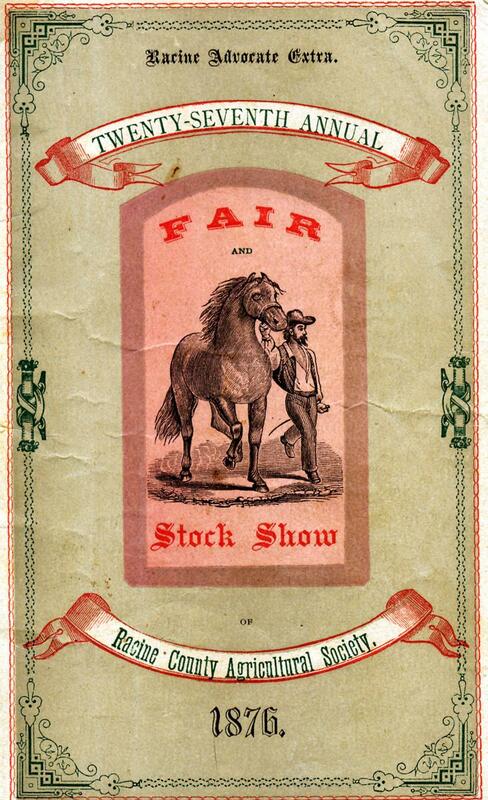 A Racine group, the Racine Industrial Association, had organized a fair in Racine in September 1884 and continued to hold a fair there until about 1893, when financial failure brought it to a close. From then until 1923, there was no Racine County Fair. In 1919 the Racine County School of Agriculture at Rochester held the first of its annual school fairs, where its students' projects were exhibited. In 1922 Earl A. Polley, a member of the Agricultural School's faculty, called a meeting of persons interested in holding a countywide fair and the Racine County Fair Association was formed. In January 1923, Rochester, Union Grove, and Burlington presented proposals for holding the fair. The group chose Burlington as host for the first "modern" County Fair in 1923. Schwaller's Grove (now known as Riverside Park) on the banks of the Fox River was chosen as the site. The Fair was a success, reporting a profit of about $2200. Thereafter, Union Grove expressed its strong interest in hosting the Fair, and in 1924 the Association voted to hold the County Fair there. In 1925 the Association signed a lease on the Old Settlers grounds in Union Grove, where the Fair has remained ever since.